Cakes & More: The Daring Bakers Say Panettone! - A Lower Fat, Quick Version. The Daring Bakers Say Panettone! - A Lower Fat, Quick Version. Whew!! Just back from the (no-longer-little!) little brother's wedding celebrations, tired but very happy to welcome the newest member into the family! To say its been a hectic December would be an understatement. The flurry of activity in the month just made me realize how different it is to be married with two school-going kids, run a household, do all the never-ending wedding shopping for myself, the kids and hubby, and pitch in for help for the wedding. Thankfully my parents live in the same city, though quite a distance from my place. For once I was thankful for the Christmas vacations as the kids would not have to miss school to attend the wedding. The wedding finally, then back to the parents', then back home for some quick unpacking and re-packing for the wedding reception at my home-town. Groan! I never really got around to write the post for the Daring Bakers this month...had to write the post before I boarded the train! 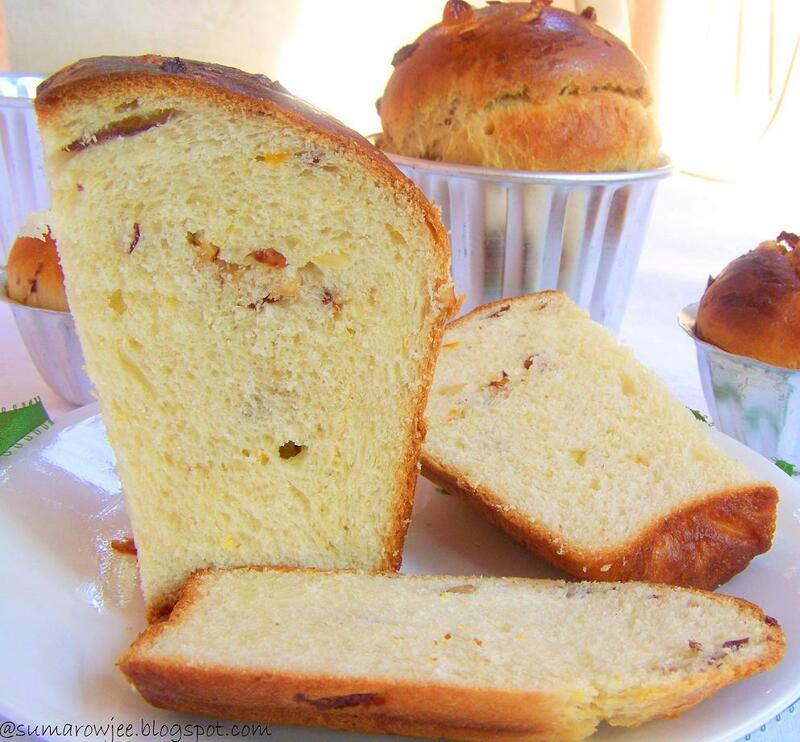 Panettone, popularly made during Christmas in Italy, is a very rich, sweet bread traditionally made with wild yeast. 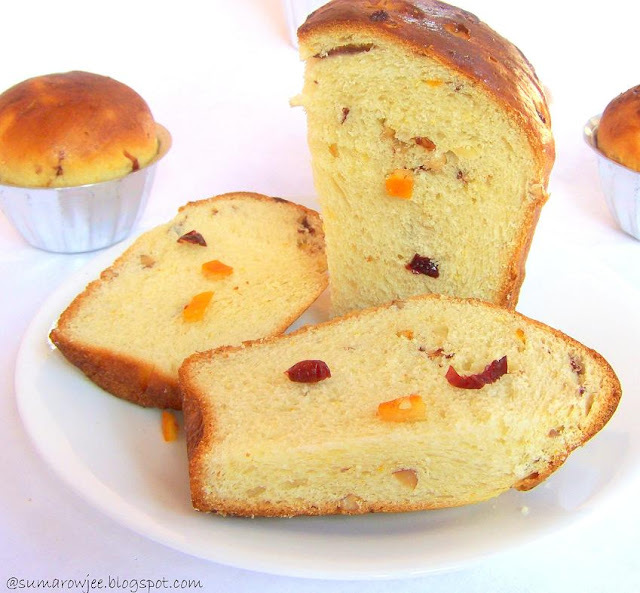 Dried fruit, candied peel, orange/lemon zest or even chocolate is used as filling. Marcellina's favorite recipe for the panettone was a very tempting one to try, promising to be rich, fruit studded deliciousness in every bite. The recipe involves making a sponge, followed by more proofing steps, translating to more time and undoubtedly great results too! The original recipe also has more than a substantial amount of butter in it, 1 1/2 cups to be precise!! Since I am currently on a restricted diet this was off-limits for me. The logistics with the time involved in baking the bread seemed impossible too with all the running around I did. 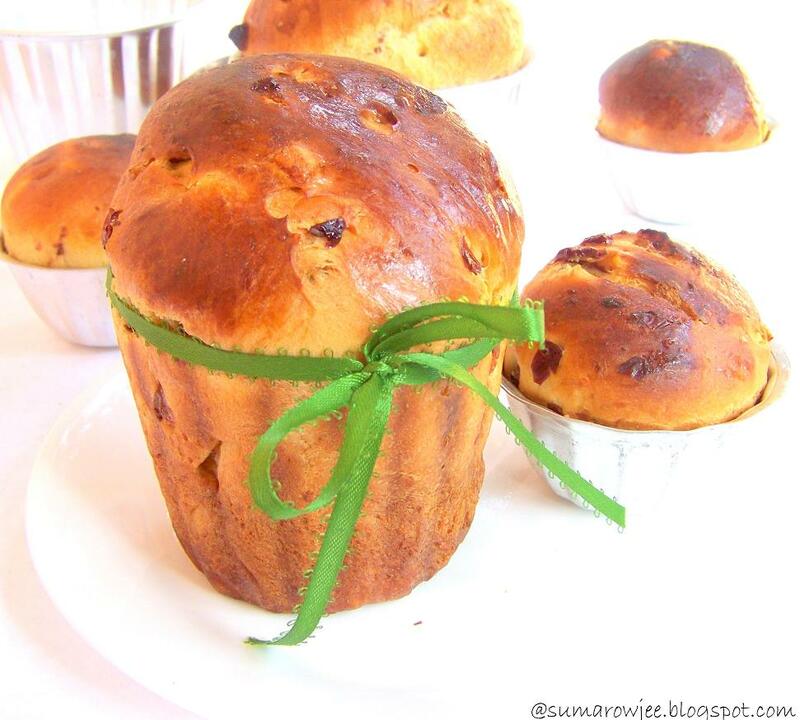 I finally thought - my choices - bake a panettone with less fat, a quicker one, or none at all! But I so wanted to bake a panettone even if it wasn't the most authentic one ever! Marcellina very kindly allowed this change and my bread was baked with 1/4 cup of butter and in about 3 hours! 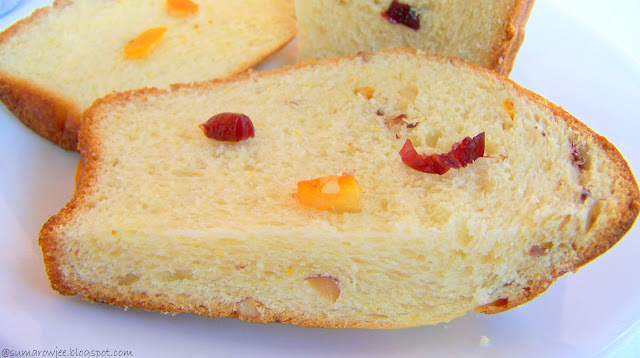 I had so loved the brioche I had tried last year and there wasn't any reason it shouldn't taste good with candied orange peel, dried cranberries, nuts and orange zest in it. Making a traditional panettone involves baking it in a panettone mold, store bought or home-made. I baked mine in these molds I got from Spar recently, the left over dough went into smaller molds. 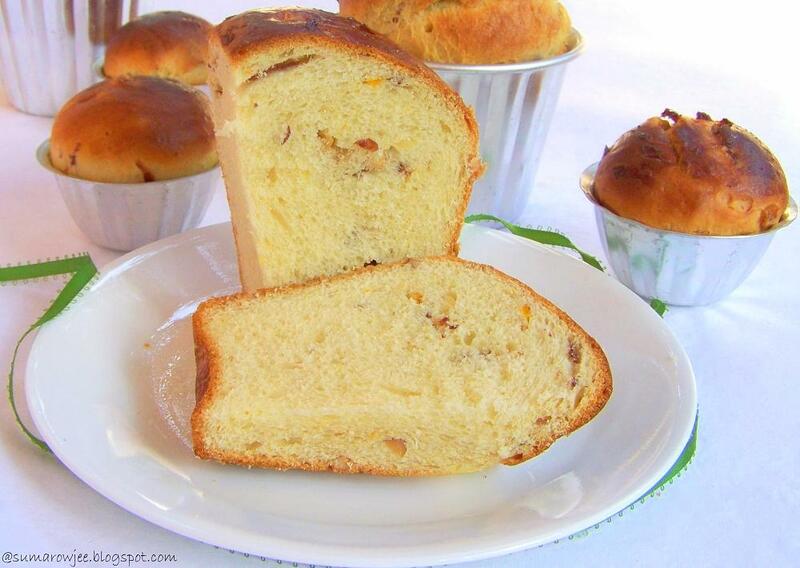 Panettone made with Champa's brioche recipe as the base. Sugar glaze or a luxurious almond glaze - Optional. Procedure : Sift together the flour, gluten and salt very well. Keep aside. Whisk the eggs lightly (just enough, no need to whip up a volume), add the vanilla . Set aside. Mix in yeast with warm water and sugar. Add melted butter and egg mixture. Slowly add flour and make the dough. Add the remaining one tablespoon of water gradually if needed. The dough must be soft and silky, but not sticky. Knead the dough for 10 minutes and place in a well oiled bowl or dough rising bucket, turn the dough once and cover it. Let it rise till double in volume. This took about an hour. This time may vary. In the meantime, prepare your pan /pans. I greased and lined mine with parchment as it has -- edges. Deflate the dough. Gently knead in the dried fruit and nuts. The fruit kept falling out and I had to knead them in again, guess I over did this bit. Next time, I shall try the procedure suggested in the recipe (Press out one portion of dough into an oval shape. Sprinkle over one quarter of the filling and roll up the dough into a log. Press out again into an oval shape and sprinkle over another quarter of the filling. Roll into a log shape again. Repeat with the second portion of dough. Shape into a ball/balls and slip into your prepared pans or tins or panettone molds) Let rise in a warm place till double again. Towards the end of the rise time, preheat the oven to 190 degrees C / 375 F. Just before placing the pan in the oven, being careful to not let it drip down the sides as it will glue the bread to the tin/tins, brush the tops with the the whisked egg. A silicon brush works really well here. Place it in the oven and bake for 15 - 20 or more (depending on the size of the bread) minutes. Stick around and watch how beautiful and high it rises! Remove from the oven and tent with aluminum foil to prevent too much browning. The aluminum foil will keep slipping if baking in a microwave, so give up!! Reduce the temperature to 180 degrees C / 350 F and bake for another 10 to 15 minutes or more depending on the size of the portions you bake. The temperature on the instant read thermometer must read 200 F. In case you don't have an instant read thermometer it should sound hollow when tapped and should have a beautiful golden light brown crust. Do not over bake (notice the difference in the color and thickness of the crust here and my brioche, this one is over-baked). If baking in a 9''x 5'' loaf pan, bake for 20 minutes at 190 degrees C and 15 minutes at 180 C. Remove from the oven and brush the top with butter. Remove to wire rack after 5 minutes and let it cool completely before slicing. You could top with a simple sugar glaze if you wish to. I made an error of judgment in approximating the baking time, over-baked it a bit, but enough to dry out the bread slightly. I could have kicked, kicked myself for this!! So be careful with the baking time, check 5 minutes earlier than later. And tell me if you know of a gadget that can help approximate the right baking time for different tin sizes. So it was still a tasty bread, just about sweet, wonderful toasted lightly ( I prefer doing this on a tawa with a light smear of butter). So if you need a quick enriched bread dough without a whole lot of fat, try this recipe! Thanks so much Marcellina for this treat, I do hope to try your recipe sometime! Flour : Champa uses 2 2/3 cup of bread flour. One cup of bread flour is one cup APF plus 1 tablespoon vital wheat gluten. I have used 328 grams grams of APF plus 25 grams of vital wheat gluten to make the bread flour. One cup of APF measured by scoop flour into the cup and level method weighs 130 grams. I have weighed 2 2/3 cups taken out 2 tablespoons plus 2 teaspoons flour and replaced it with 2 tablespoons plus 2 teaspoons of gluten. Whew! Eggs: The recipe specifies 2 extra large eggs, one large egg weighs 48 grams without shell. I have approximately taken 120 grams of egg (without shell) as 2 extra large eggs. Your aim would be to get a soft silky, non-sticky dough. I would suggest starting with lesser water (mentioned above) and add more if needed. I guess adding too much flour to adjust the consistency will change the texture of the bread, so would be safer to start off with lesser liquid. Champa has used 1/2 cup plus one tablespoon pureed silken tofu in place of the eggs. She has used a mixture of 1 tsp milk and 1 tsp olive oil in place of the egg wash for brushing before baking. The low fat, quick version panettone is Yeast-spotted! Delicious and lavish looking cake. Excellent preparation dear. Also A Very Happy and Blissful 2013 . Hope you have a rocking year. Wow Suma... this looks really cool... So tempted to try it out... Happy new Year to you and family! Like the shape of those moulds. Pretty looking panettone. Have a great year ahead Suma ! Hope you enjoyed and had wonderful time in your brother's wedding. Lovely transformation from brioche to Panettone :) It has got beautiful texture too:) Loving it. wow that is so tempting!!! bookmarking it!!! Thats a stunning panettone, beautiful bread Suma. Amazing preparation dear. Never tried or tasted this before. Oops.... a panic call here!! I mixed this dough last evening, but it wouldn't rise :((( The yeast never gave up on be here earlier!! Not sure what to do with the dough now... refrigerated it... Any idea how i can use the unrisen lump of dough? ?